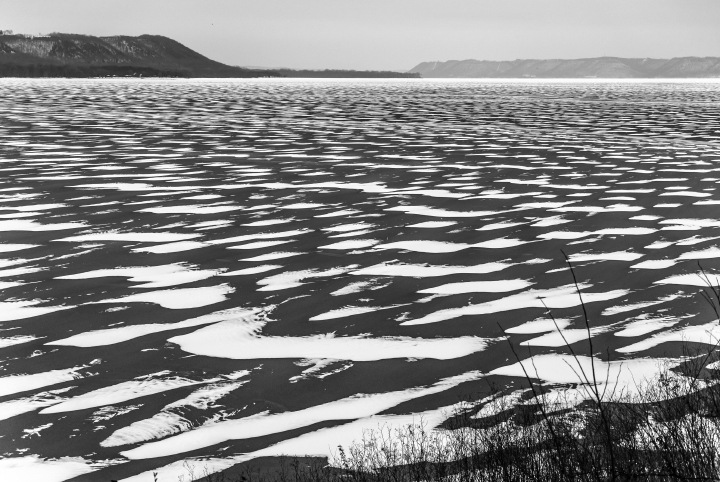 The image above depicts something curious, windswept patches of snow on a frozen river. The pattern is unusual in my experience. But is it anything really unusual, by nature's standards? That's a question for someone more knowledgeable than me in the chemical and physical dynamics of water, water vapor, wind, and perhaps of this particular location. For instance, I want to know if the space between the light patches represent areas where the water has thawed and refrozen since the last snow. Or, are the dark spaces between representative of areas where the wind has cleared the underlying ice? And if so, what forces have preserved the white patches? Or, have processes all together different from those I have imagined at work here? What is the correct analysis? And how am I to know if the analysis presented is, in deed, the correct analysis? In either a figurative or literal sense we often use numbers to describe what we perceive to be the underlying truth of what is before us. Numbers well tell us what we need to know, we think. And they can. But only if we know how to use and interpret those numbers with wisdom, without errors in thinking that lead to calamitous consequences. Numbers are also a huge part of news stories these days. Statistics are quoted left and right. Unfortunately, those who write such stories are not always adept nor even truthful about exactly what those numbers mean or reveal. And those of us who read and listen to such news stories often possess even less sophistication with regard to interpreting numbers presented. Three errors seem to cause the most confusion. And those errors of thinking have been with us for a very long time. The first error in thinking is the false belief that coincidence is the same as causation, a belief that has provided basis for humanly tragic magical, religious, and intuitive thinking for as long as there have been humans. Coincidence is not the same as causation. The second error involves sampling. A small sample extrapolated to a huge population or length of time is only valid if the sample is truly representative of the larger population or length of time. For instance, to say what is true of one or two people must, now and forever, be true for all people is nonsense unless all possible intervening factors and differences can be eliminated as relevant. The third error involves doubt. To say we know something with no possible doubt is seldom the case. But to know something with a moderate to large degree of certainty is very common. However, measuring risk due to any particular degree of uncertainty is not something most humans do very well, and never have. Many arguments and even wars have developed over the interpretation of numbers. The risk of that danger is only increasing with more and more confused and dishonest presentations of numbers in the news that we depend upon. Learn about numbers. They can be your best friend and defense against misstep, exploitation, and influence toward distrust and war. More than any other time in human history, we need to be talking the clear language of numerical certainty, not the muddied divisive language of numerical nonsense and fraud.